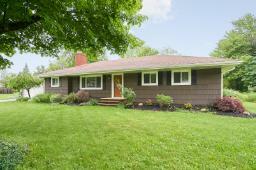 Charming Updated Ranch with Basement, Deck, and Two Car Garage! 3 beds, 2 baths. Welcoming living room offers hardwood floors, a large picture window that lets in plenty of natural light and a beautiful wood burning fireplace. Eat-in kitchen boasts white cabinets, solid surface countertops, ceramic tile flooring, and built-in countertop range. Living room and dining room combination with hardwood floors throughout. Sunroom offers skylight, ceramic tile flooring and sliding glass door that leads to the deck and backyard. Updated first floor half bath with pedestal sink. Master bedroom with two closets. Two more good sized bedrooms on the first floor. Two car attached garage. Full, unfinished basement provides a laundry area, storage and is a great space for a hobby area or can be finished for additional living space. The backyard provides a great space to enjoy the outdoors. Many possibilities! Updates include: blown in attic insulation 2018; new hot water heater 2017, new septic system 2008, updated windows, roof, furnace, and central air unit, paint, and flooring since living in the home over the years. All appliances stay. Move in ready! Great location near parks, golf, shopping, and two freeways. freeway. Fantastic opportunity!